Google Sheets: If a drop-down value is selected, how do I add it to another column and then collect the sums? So I have a drop-down menu in Col K with "Apple, Orange, Grapes, Cherries". 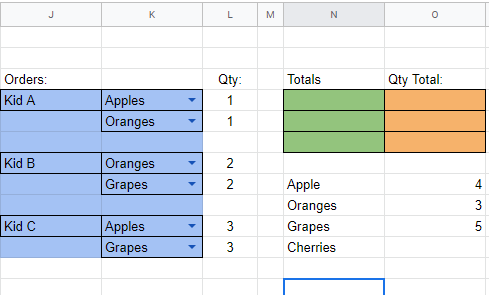 If a child wants to order a specific fruit, I want them to automatically fill in the Col N section in green and then add the total amount needed to order in Col O. My expected values ​​are in the lower right … How do I achieve this black magic? Next Next post: Symfony installation in shared hosting.